So I went for Week 2’s long run today, 9 miles. Made it in before the rain, fortunately. I’m watching the Patriots right now and wow is it coming down! Overall it was a great run through Quincy and by the water. I don’t mind when it’s a little cloudy. It was warm enough I didn’t have to get all bundled up, so that’s always nice. But enough about running, for now. In the spirit of this blog’s title, I figured it’s time to talk about the “Eat” part and share some food. Please keep in mind I’m obviously just a home chef. That said, I think I do pretty well. Admittedly most of my inspiration comes from others’ recipes, but sometimes I make my own creations and I’ll be sure to share those as well. I always hated cooking but did find a love for making my own food about 3 years ago. It’s really only been this last year, however, that I paid a lot of attention to the quality of ingredients I was cooking with and the quality of the meal overall and its nutrition. I was particularly inspired this weekend thanks to a Christmas present, the follow up cookbook to the original book that inspired me about 6 months ago. 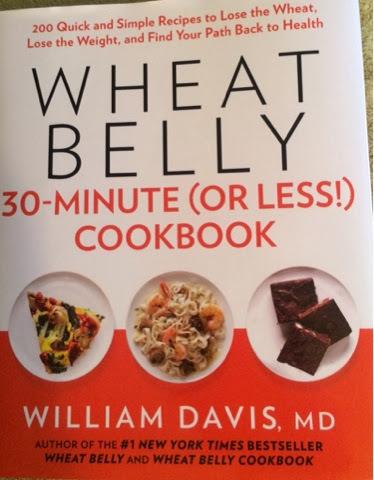 Dr. William Davis is the creator of “Wheat Belly,” and after reading his book I felt inspired to try the wheat-free lifestyle. Since June I have been pleasantly surprised with the benefits to eliminating wheat in my diet (maybe aside from the occasional beer, because c’mon, I’m only human!) I’m grateful that I do not need to have the diligence of someone with celiac disease, but nonetheless I have found I have little to no desire to consume wheat products anymore. I’m pure at home with this approach and only sometimes have “slips” at restaurants in the forms of sauces, dressings, etc…I don’t hold myself that steadfast in those situations (and give so much credit to those who need to!) This new lifestyle has helped with weight loss but, more notably for me, also with an overall feeling of well being, increased energy and improved mental clarity. Cooking and eating this way has been less difficult than I anticipated. I’ve found that when the quality of the food I’m eating is high, I’m more satisfied and generally eating less. Additionally, as is one of the main components of this lifestyle, eliminating wheat keeps your blood sugar more level throughout the day, thus minimizing, or even eliminating, cravings. I know it sounds hard to believe, but try it for 2 weeks. Be diligent and I promise you, you will eat less. Eating healthy was always hard for me because I felt like I was ALWAYS hungry. But now when I look back, I realize my healthy eating was brown rice, whole grain pasta, whole grain bread…all things that make your sugars go crazy and, in turn, drive your blood sugar into major peaks and valleys, the deadly curve that leads to cravings and insatiable hunger. Dr. Davis’ follow up cookbook was given to me by my mom for Christmas this year and I’ve already made 2 of the recipes. First was for lunch this afternoon. I really love tuna, but part of the joy of tuna for me was a tuna sandwich. There are breads made with alternative flours that are wheat free, but as Dr. Davis explains part of being successful is cutting out wheat AND keeping a lower glycemic index. Sadly many of the mass marketed “wheat/gluten substitutes” do nothing to regulate your blood sugar levels and end up being just as bad for you as if you picked up white bread. (There’s a ton about this if you do some googling and I’d encourage you to read further. I’m no expert, but think I have a handle on the basic concepts). Anyways, I felt like tuna and it’s a bit too messy to wrap in a lettuce leaf (an alternative vessel for sandwich meats I’ve actually learned to enjoy very much!) The solution was the “Tuna-Tomato Melt.” Upon seeing it, I feel this is hardly a novel idea, yet it was something I hadn’t ever tried. I often pair many of my dishes with a really bright salad. I have to say, though, this tuna cup was just fantastic. For an easy do-it-yourself, make tuna to your liking and mix in half a cup of shredded cheddar cheese (use this ratio if you’re planning to make 4 “cups”. So 4 tomatoes, 2 cans of tuna). I whimped out and didn’t make my own mayo, this time, but I did buy an organic brand with extra omega-3. You bake them for 8 minutes at 375 degrees and then top each with a little more cheddar and put them under the broiler for another 2 minutes to get that nice bubbly topping. I made this entire dish in about 20 minutes and only used my toaster oven, which I also find to be a huge plus! The way they are contained makes them perfect for the coming days’ lunches and these will be perfectly portable for work! I also made myself a new recipe for dinner tonight. Sundays I often make a lunch and dinner recipe that will cover me for both of those meals for the next 2-3 days. This foresight and preparation has also been a huge key to my success in healthy eating as it takes away any need to think about what I’ll be eating for the next few days. 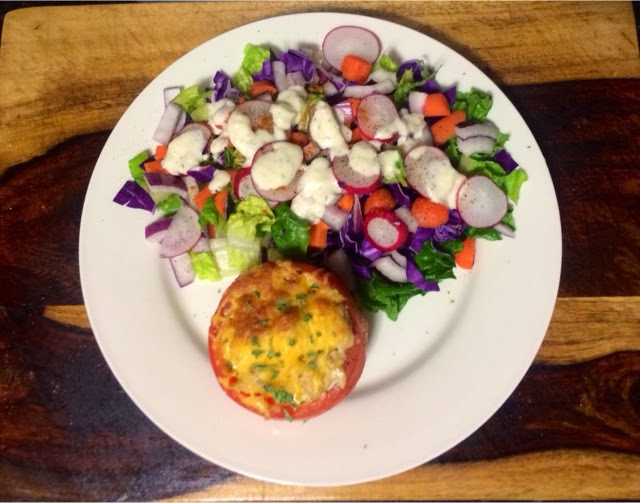 Sometimes eating the same thing can be boring, though, so weeks when I’m feeling particularly in need of avoiding monotony I will make 2 dinner recipes (usually cutting the recipe in half as most make 4 meals) and then I have some options. Sometimes I make the main part of a meal and plan to have a few options for sides because sometimes that can also change up a meal just enough so you don’t feel like you’re eating the same thing days at a time. I was never great about eating leftovers, but I learned early on I had to get over that if I wanted to a) eat healthy and b) save money. 1) The “rice” is cauliflower! This was something I started doing a few months ago as well. Sadly, rice is not great for you, especially if trying to lose weight, but it often appears as substitute for people avoiding wheat because it is gluten free. I didn’t set out initially to avoid rice, but to try and stay aware of my blood sugars I was hyper aware of portion control. Well let me tell you, you’ll often see the recommended serving size for brown rice anywhere between 1/4 – 1/2 cup and for me, this just feels like nothing. Then, if you look at the calories, I was like this is just so not worth it! So I read a lot about other creative substitutes and cauliflower kept showing up. I suppose if you don’t like cauliflower than this is no good for you, but I for one am a fan so it has fit in nicely to many of my recipes (even using it in place of breadcrumbs for meatloaf!). I have the Vidalia Chop Wizard vhttps://www.chopwizard.com/ and this makes cutting cauliflower in to the right consistency super easy. This recipe, and many others, suggests a food processor which I imagine would also be nice. One day when I have the space and my dream kitchen! Best part is there’s really no cooking required. Cover it and throw it in the microwave for about 4 mins (if you chopped up a full head) and voila! I always get the perfect consistency. 2) Coconut Oil. Aside from the abundance of healthy fats gained by using this in cooking, it also imparts a really nice subtle flavor that lends itself perfectly to this type of recipe. I try to use Coconut Oil as often as possible in my cooking and have yet to be disappointed with the results! 3) Eggs. I don’t eat enough eggs but there is more and more research about the benefits of eggs and I’m trying to find ways to use them more often in my cooking. 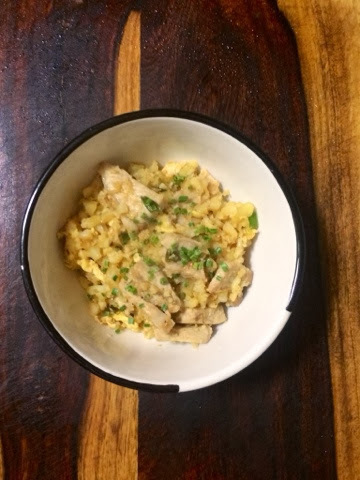 This recipe calls for 2 eggs and helps add to the feeling of the typical pork fried rice you think of from Chinese takeout. Final note on this recipe, remember to pick up some wheat/gluten free soy sauce! I promise, it tastes no different! So my first post about “Eat” got quite lengthy. I look forward to sharing future recipes, as well, and would love to hear what others are making! I am not sure about copyright laws about these recipes so I did not post them directly here. That said, if you’d like the actual recipe please don’t hesitate to contact me and I’d be more than happy to pass them along.